Eurodollar is still being corrected. Possibly, price will start new descending movement in the nearest future. Target is still in area formed by lower fibo-levels between 161.8% and 300%. 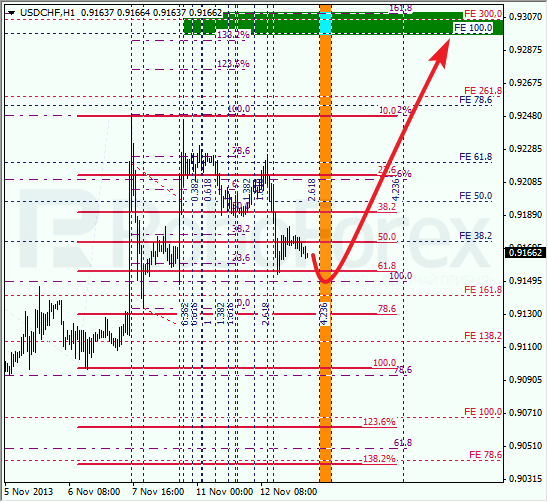 As we can see at H1 chart, pair is getting closer to one of temporary fibo-zones; correction is 61.8%. If later market rebounds from this level, bears will continue pushing price downward to reach new local minimum. Franc is also being corrected. Right now, I’m staying out of market. However, I’m planning to open long positions as soon as pair starts new ascending movement. Main target is in upper area with several fibo-levels. At H1 chart, pair is getting closer to one of temporary fibo-zones. Possibly, Franc may rebound from it and move towards new maximums. Local correction is already 61.8%.